Your wheelchair is what sets you in motion if you can’t get there yourself, so it is an incredibly valuable tool in your quality of life. Whether it be for you or a loved one, you want to make sure you have the right wheelchair for all of life’s moments. You need one that is not only safe but also comfortable. For some, having a lightweight wheelchair could be vital because it affects the way you get around. We’re reviewing the best lightweight wheelchairs currently on the market. 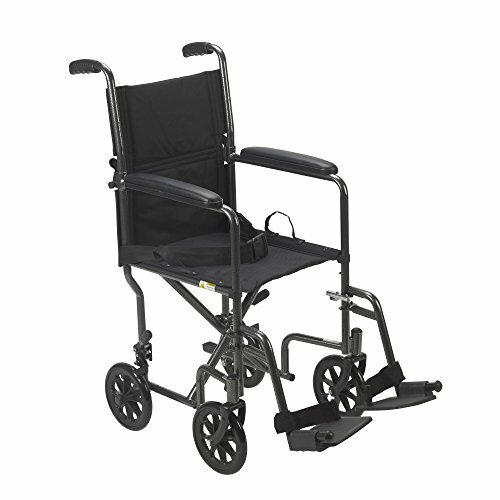 This transport wheelchair is a great option for temporary transport from place to place but is not a long-term solution. 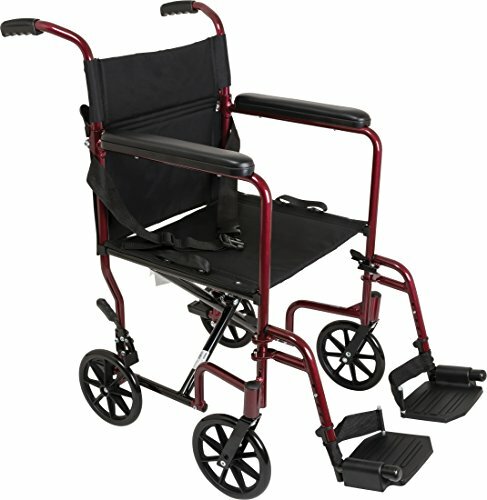 This best selling transport wheelchair is a great option for older adults who typically have a caregiver else push them rather than manually rolling themselves around. It has 12-inch wheels on the back for outdoor traction and manual hand brakes for added protection. The frame is solid and powder-coated to prevent rust, and the chair has an overall weight capacity of 300 pounds. This chair doesn’t provide much in terms of comfort since it’s not intended for long-term sitting. However, we did appreciate the wide seat, which should accommodate most users. This chair is a great choice if you do not plan on transporting yourself around. It is more comfortable than most transport chairs but it is a bit small. This wheelchair only weighs twenty pounds and easily folds up for transport or traveling purposes. It also features 12-inch wheels which help create dependable traction outdoors and on uneven surfaces. Two of our favorite features on this chair are the seat belt and push-lock brakes, which give seniors an added sense of security when riding in it. 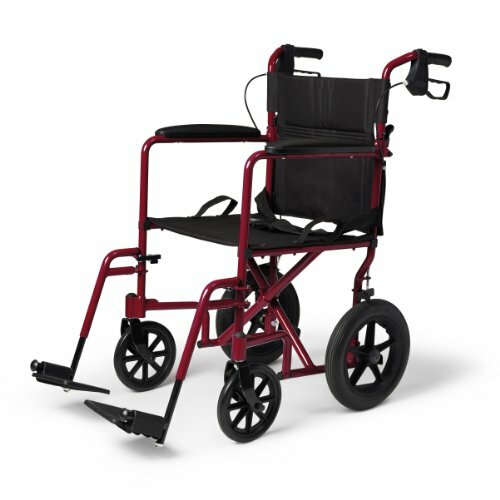 The handles on the top comfortable for caregivers pushing a loved one, and the seat has a little more padding than you typically see in a lightweight wheelchair. We do wish that the footplates were more adjustable, especially for taller seniors. If you are over six feet tall, you most likely will not be able to use the footplates. This chair is the perfect size for transportation to places like restaurants because the chair fits nicely under tables. This lightweight option is easy to operate and fits nicely under tables thanks to its height. One unqiue thing we noticed about this chair is its upholstery. It is nylon like most models, but it is more stretchy, breathable, and comfortable than most materials we’ve encountered. The chair also has armrests and elevated leg rests which promote overall comfort for the senior using it. The Medline chair has large mag wheels to allow users to roll themselves, as well as a two-inch height adjustment to accommodate users who are shorter or taller than average. This model is heavier than the previous at 33 pounds, but it can also carry more. Its standard weight capacity is 300 pounds. This lightweight chair is one of the lightest on the market and it folds up to almost nothing. This high-end chair will be a favorite for seniors who prioritize comfort. The padding is incredibly plush and hugs the body of the user. There is also padding on the back and the rear area, plus padded armrests and elevated leg rests. 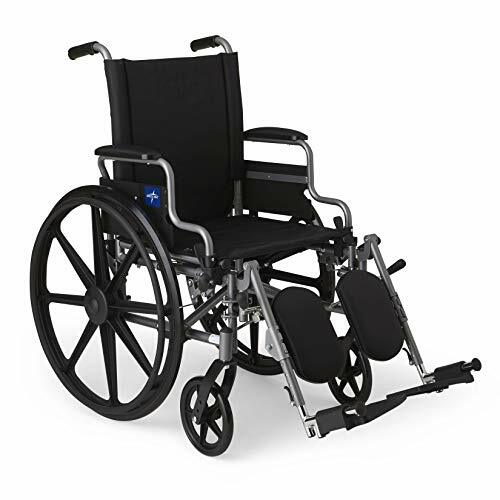 The chair features a seatbelt and heel loops to help secure the user as well.While this chair is a bit more difficult than the previous for the user to roll manually, it does come with hand grips on the wheels to make it possible when necessary. Overall, it’s probably a better option for seniors who plan to be pushed more than they plan to roll themselves. We were also impressed with the size of this chair compared to its weight. It is light at only 19.8 pounds, but features a wide 18-inch seat. For the price you get a lot with this option. You get a chair that has a nice comfortable nylon upholstery and is easy to clean. You also get a durable chair that serves its purpose. This chair is for seniors looking for all the features of a reliable and durable transport chair on a budget. Despite its low price, the Drive Medical chair comes with a durable frame and enough weight to keep the user firmly grounded. The armrests, chair, and back are all cushioned for the user’s comfort, and the upholstery is easy to clean without having to remove the padding. We were also very impressed with this chair’s maneuverability. It rolls everywhere you need it to go without having to adjust the direction and reset constantly. This basic chair provides a lot of comfort and stability to the user. It is a little heavy though. This standard chair accomodates most seniors’ needs without a lot of extra features. It comes with swing-away footrests which move quickly out of place as well as an adjustable seat and adjustable armrests to accommodate different body types. This flexible model allows seniors to roll themselves manually or be pushed by a caregiver. The ride is smooth, and the tires also work nicely outdoors. The Karmin chair comes with soft padding on the back and the bottom area, which make it one of the most comfortable lightweight wheelchairs on the market. It comes with added armrests as well, plus a strap that covers the legs, so that seniors will have extra support when using the leg rests. The back of this chair forms an ‘S’, which serves an important purpose. It prevents the user from sliding down into the chair while they are sitting. Instead, it corrects their posture and keeps them in an upright position. This could be helpful for seniors who are recovering from an illness or injury and haven’t regained their full strength yet, or for older adults with back issues. While they may not be as comfortable as the high-end fancy chairs, lightweight wheelchairs do offer a necessary purpose, and that is to get you or the user from point A to point B.
Opting for a lightweight transport wheelchair doesn’t mean you have to sacrifice things like comfort and “extras”. As the market changes, manufactures are able to incorporate more of these special features into even their lightweight models. Of course the most important feature to look for in a lightweight transport wheelchair is its ability to get from place to place. Here are a few other things to consider. If you are choosing a chair to help transport your loved one, it’s important to think about weight – both the weight of the chair and of the user. The chair must be light enough to carry, but sturdy enough to accommodate the person sitting in it. Transport chairs typically weigh between 25-35 pounds, and they should always be collapsible. Chairs in this range do not add too much weight, so it’s easy to push someone around in them. They should also ideally allow the user to roll themselves, too, if necessary. Transport wheelchairs are made to move, so you want something that gets around easily. Look for a chair that’s agile in tight areas and has good traction on grass, gravel, and other non-solid surfaces. Pay close attention to the way the chair moves, both for the caregiver and the senior. You want to make sure it’s easy to maneuver for both of them. Make sure to think about the needs of the user when thinking through safety features. If you’re buying for a senior who struggles to hold themselves up, you’ll need to look for features like seat belts and calf loops. These extras can help ensure the user stays securely in the wheelchair at all times. Like we said earlier, lightweight transport chairs should still be comfortable for the user. Some lightweight chairs today come with quite a bit of padding to make the transport process more manageable. While these chairs are not intended for long-term sitting, manufacturers are still improving the amount of comfort they provide. Before purchasing, check to see that the chair offers ample padding for the back and buttocks, plus padded armrests and leg rests for extra cushion. 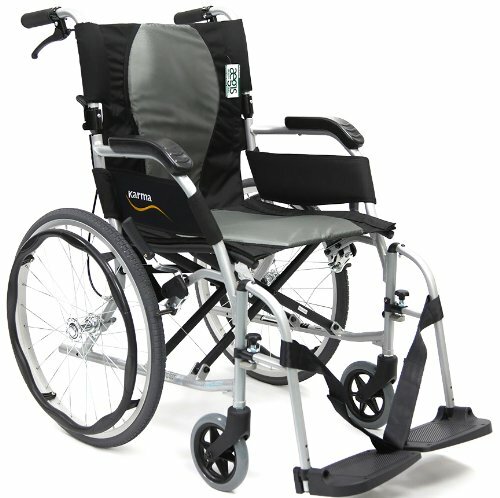 If you’re looking for a great lightweight transport wheelchair, there’s good news. Because manufacturers have substantially improved their offerings for this type of chair, with better comfort and convenience across the board. Seniors looking for a back-up or short-term wheelchair should have no trouble picking one from these options.